We are so happy to share our latest newsletter with you. 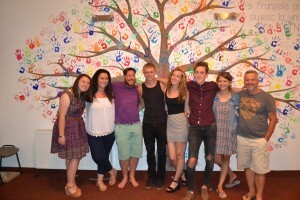 Well we have now come to the end of another summer of Micro Gappers and volunteers. We have seen many volunteers come and go this summer and at one time we were hosting around 21 people for at least a week at Casa Albert. Beth had to call on all her cooking skills to keep them all fed and watered. The beauty of having the Micro gappers this year was that we had around 8 official gappers in the first month of July and 4 in the last month of August and these were mixed in with the groups and individual volunteers that joined us over the summer so we were never short of volunteers which meant (drum roll please) the main loft at Casa Lumina was finally cleared of around 18 years of rubbish which had been hoarded there over the years (just in case) well just in case came to end with a sudden abrupt invasion of eager volunteers some of which had been dreaming of this moment for a long time! We were however met with a bit of resistance but once the ball was rolling the Casa Lumina staff got the idea! So with a lot of blood sweat and tears the job got done. There was also a crash course in Arc welding for a couple of our volunteers as they learnt on their feet to weld our new fence in place at Casa Lumina along with the building of another garden shelter this time to provide cover for the ever growing washing that is produced by Casa Lumina day by day. And of course the summer would not be complete without a bit of concreting, so the bicycle road for the young people at Casa Lumina was extended to the gate giving them a slightly longer road to practice their three wheeler biking skills. Along with all this activity at Casa Lumina there was of course the Saturday morning open air kids club at Poiana Negustorului which was great fun and sometimes a little challenging but it wouldn’t be Poiana without a little bit of a challenge would it? Another big success this year was the introduction of the volunteers to our in patient children’s Hospice ‘Hospice Lumina’ the staff and the children that were there over the summer were truly blessed by our volunteers and our Micro Gappers who in the last week didn’t want to leave the place. I think their efforts there were really appreciated by everyone. Last but not least we continued with some renovation work at Casa Albert as we endeavour to use it to help us raise much needed funding. It can be used for our school volunteers which we are hoping to expand upon next year and it will be available hopefully on Air B and B in the near future… at this point I would like to say any group church school of business group looking for a venue for a retreat or training or cycling or walking holiday why not give us a try? Well that’s about it from me and CITD for now we hope and pray that God continues to bless our work and all the families we reach out to in his name and of course you guys without whom we couldn’t do the things we do! You see God uses us all to get his love and care out to a hurting world! We hope you enjoy looking over our news and sharing in some memories. We are offering you £100 to host a fundraiser for CitD! We are so thrilled to share our latest news with you. Wow 20years of CITD who would have believed it? I certainly wouldn’t have! But when I look back I see so many wonderful times and moments good and bad, I am reminded that these things help form us and create in us the character that God wants us to be! He uses the highs, the lows and the in betweens to position us for what he has in store for us and the ministries he placed into our hands! We looked at what we had and we used it. That being said we always tried to be good stewards of what God gave us. We still are, but as we grew and as God grew CitD these things such as cash flow projection came into play, governing bodies don’t take kindly to us reporting, “well we believe God had called us” or “we are stepping out in faith!” Doesn’t go down too well with the charity commission. God tells us to respect and honour our governments’ taxes etc… So we do and we do produce these things, every month in fact now days. That doesn’t mean we have lost our faith or our vision, no not at all, it means we can make sensible decisions based on what we see and what we hope for and have faith in! God has been faithful to the children and families that we have worked with for the last twenty years and although times can be hard he has always provided one way or another. He does what he does and we do what we need to do and the job gets done! God uses believers and non-believers to love and care for his creation that’s you, me and whoever! I’ve met some beautiful people along the way Christian and non-Christian and those who just don’t know! 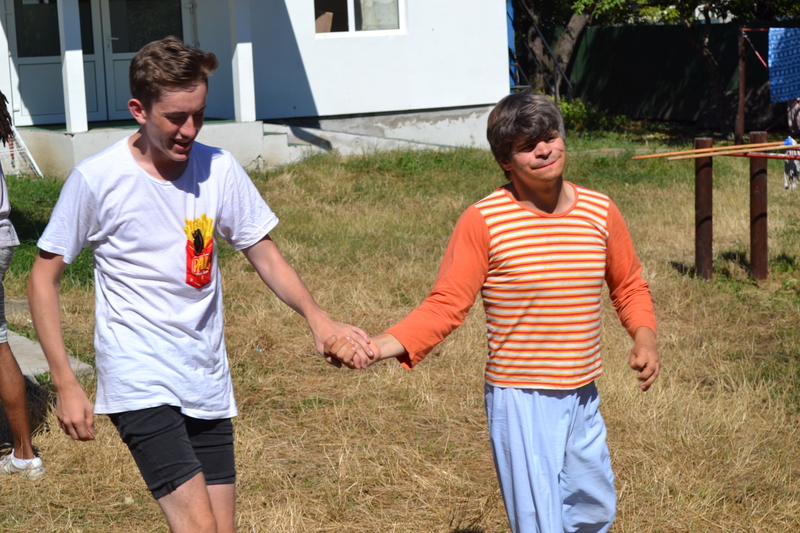 All I know is that even last year over 150 volunteers came through our projects in Romania and God used them all to care, play, entertain, build, dig, mix, cycle, run, talk, preach, cry, laugh, pray and most of all love! CitD will continue to do what God calls us to do but most of all continue to love those created in God’s own image. You, me, us, and them all, marginalised or not let’s just try and fill this world, Gods world with God love and you don’t have to be a Christian to do it! Ooooooh controversial but hey that’s me! So here’s to another great year with the glory going to God and our beautiful brilliant supporters’ thank you and may God bless you through all the coming year and beyond! Well as we look towards Christmas and the New Year. I for one take time to reflect back on what has been an exciting but challenging year once again! Firstly, I would like to thank all our faithful supporters old and new alike without such support we couldn’t do what we do out in Romania and with the handful of schools we work with in the UK. I would also like to thank my board of trustees here in the U.K. for their support and patience over the last year. As we move towards a new year we already see it’s challenges ahead but we have a God that already knows our needs and what we need but that shouldn’t stop us from asking just the same! This exercises our faith and trust in him that set us on the road in the first place. I look at the world today and see a lot of suffering, waring, fractions and people dying, so to try and fill the world with a little hope, kindness and love is more important now then maybe ever before. As human beings let’s pull together whether we are Christian, Muslim, Buddhist, Sikh or have no faith at all. Let the voice of unity cry out across the world and let’s see headlines of love, kindness and compassion ringing out! We can all make a difference in the world that surrounds us and beyond that too. Sometimes it’s just a smile or maybe the offer to just lend a hand in a small way but that makes a difference. 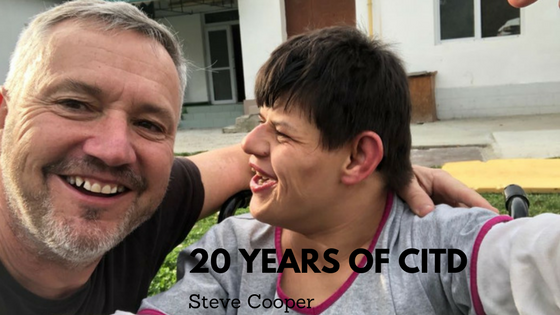 18 years ago we started a small orphanage in North East Romania where our vision was to love and care for some of the most down trodden children of that time. Today the same children are now young adults and are still being loved and many have learned to love back. Those of you that have visited Casa Lumina will know this from experience and what a wonderful place it is! Our work now has grown through our NGO Asociatia Lumina and the Palliative care services we provide in the region. We are a guiding light for paediatric palliative care and now we also have voice at a national level which is something wonderful and we could never have dreamt of it. But this is Gods work and Gods hand wants to hold and love those children and their families through our work there and the wonderful staff we have at all our projects in Romania. Let’s not forget the Brits too that still come out and volunteer in the summer through our schools work and mission trips for adults and young people. Next year we have 10 Micro Gappers signed up to spend two months with us in Romania this is the most we have ever had, Beth Johnson and I are really looking forward to next summer and all that it brings. So with that mention of Beth I would just like to say what a great women she has become, strong in her commitment to the cause and strong in her faith in God. Tirelessly, working for the good of the projects and serving not just the volunteers but me too always with a smile and cup of tea in the mornings! Not just that there is a whole list that I could write but let’s just say she’s a great PA and coordinator of volunteers! Better stop there as I don’t want her getting too big for her boots lol! As you may have seen we have launched a £2 a month appeal and if you don’t support financially at this time could you please think about it. We really need your support more than ever in the coming year. Would you consider helping us by committing to £2 a month? It’s not even the cost of a cup of coffee at Costa or Starbucks! Well that’s about it from me for this year. May God bless you and your families not just this Christmas and New Year but throughout the year. Remember love is the greatest power in the Universe. Use it to help change your world and the world of others near and far! Happy and a blessed Christmas. My time in Romania as a Gapper with Cry in the Dark has come to an inevitable end and it is fair to say that since I’ve returned home I have found readjusting back to normality anything but easy. The two months spent away were so busy and productive that you find yourself falling into a bubble of what you believe a normal day should consist of. Wake up, build a path, visit a Roma gypsy community, run a kids club, host a disco at Casa Lumina, etc. The list goes on! I have found returning back from mission hard as you find that you have a lot of free time and a desire to continue helping people and sharing God’s love although the way in which you must go about it becomes very different. Being disconnected from the place in which I could carry out this work led to me feeling low and frustrated at times. A volunteer (and all-round great guy) named Murray who was a member of the Comberton Baptist team, recently shared a story that helped inspire me. He told me of how when he was waiting for a plane ride home back to Scotland he got talking to a guy at an airport. They chatted and spent time with each other, and when it came to time to say goodbye Murray shared his faith with him. Wow. Last Saturday I met up with some friends for a drink at the pub, once finished I went to McDonald’s to get some fuel for the journey home. I began walking down Colchester high street when I walked past a homeless guy asking for spare change and I ignored his plea for help and walked straight past him. A few steps later I felt an overpowering urge to turn around and share my McDonald’s with the man I had just past. I don’t know why I did because I love chicken nuggets and could have quite easily eaten the box of 20! However before I knew it I was having a chicken nugget picnic with this man on the corner of the street. We got talking and he told me about his life and how he had fallen into his current situation. I realised that he was a normal guy just like me who enjoyed watching football and fanaticising about cars we knew we could never afford. He did not deserve to be in his situation, as quite often we can be guilty of letting ourselves belief. When I felt it was time to go, again I felt something inside of me, which I believe to be God telling me to share my faith. It seemed like a scary thing to do at the time but I said a quick prayer and was reminded about Murray’s story and realised that if I stepped out in faith God would not let me down. So I gave my new friend my band that I had been wearing which has on it the four points, something which the Comberton Baptist team introduced me to. God loves us, we have all sinned, Jesus died for me and I have to decide what to do next. Steve in one of his lessons told us a story about a church that has a sign as you exit saying “you are now entering your mission field”. 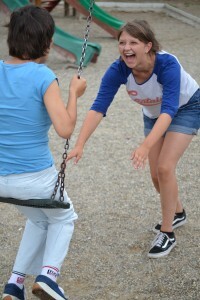 It reminded me that we all missionaries and that wherever we are is our mission field. I realise that just because I’m no longer in Romania. It does not mean that I cannot still have a positive impact on people’s lives. Well it’s been an interesting summer which as I write draws to an end. It’s not been without its challenges, its highs, its lows and everything else in between. First of all I would like to thank Beth because none of this would be possible without her, or at least most of it! Then comes this years Micro Gappers! Megan Cooper, Katie Wilkinson, Hannah Foster, Chloe Price and Dan Pledger, along with returning gapper Jack! All brilliant in there own way and all gifted in their own way too! It’s been a real blessing to work with these guys this year and if next years Gappers are half as good as them, then it will be just great. As well as our gappers we have had 5 groups of volunteers over the course of the summer. Two brilliant school groups from Manor CofE Academy in York joined us in June/July and as usual these young people worked so hard along with the teachers and the assistants that came to help. The guys from Tenterden Kent, Zion Baptist Church Kent and our new friends from Comberton Baptist Church also came to work with us this summer, they were all different and all brilliant in their own ways and we loved introducing them to our work! Well there was some interesting moments this year like trying to get your driving license back from the police after being nicked for speeding! Still if you break the law you pay the price. Then just to keep life even more interesting, whilst we were building a small house I was threatened by a thirteen year old boy welding a 3 foot long axe! But that’s a story for another day! We achieved a lot this summer thanks to the Gappers and all our friends that gave up a week or two to serve others which we love you for and whether you believe or not I know God loves it too! If you want to see photos of all the things we got up to this summer why not find us on Facebook and take a look! Monica is my one to one at Casa Lumina. We spent our first one to one together getting to know each other and I got to know what she loved and what she didn’t love so much. This was important because I wanted nothing more than to make her happy. I suppose I didn’t have any goals for my one to one, other than to build a positive relationship with Monica. I quickly learnt that it wasn’t enough to rely on my own strength to form this relationship because to begin with Monica’s behaviour tested my patience, she often repeats the same phrase or action over and over again and she’s very very cheeky. It became clear to me that I needed to rely on God’s strength because with him anything is possible. Each week I spent with Monica I saw progress in our relationship. Monica loves balloons…I learnt this when she repeatedly stuffed the balloons I had brought with me down her pants! I started to just bring one and despite asking for more Monica quickly settled for one, I started to produce one at the end of each one to one we had together and she would repeatedly kiss me when she received it, the joy written on her face made me so so glad. My favourite memory of Monica has to be when I was first allowed to take her to the park with the other young people, she was so well behaved and I was so proud of her. 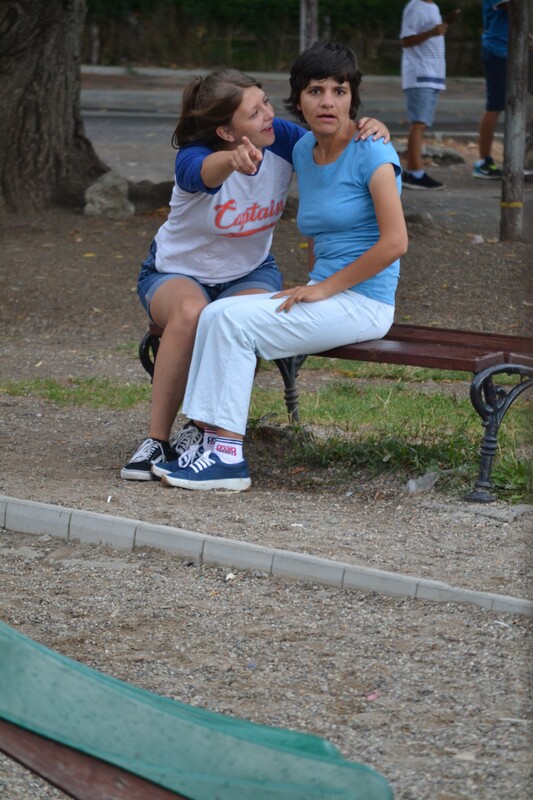 When we go to Casa Lumina with the volunteers I am so chuffed to be able to say to them that Monica is my one to one and I will really miss her when I leave Romania. If you’re reading this and you know the story of Cry in the Dark then you will know that it began with compassion and that compassion is still at the heart of the charity today. What I have for Monica and for everyone else at Casa Lumina is compassion and by spending my summer in Romania I have had the opportunity to express my compassion, in many different ways, to those living at Casa Lumina. The compassion I feel doesn’t end at Casa Lumina, it extends across the projects I have had the pleasure of being involved in through Cry in the Dark, this includes day centre at Casa Albert, working with those living in Poina Negustroloui and Ungereni. One of my highlights whilst being on the micro gap took place at Ungereni. I was sitting on the ground with a fairly elderly woman, she began to stroke my hair and repeatedly called it beautiful, when she stopped I did the same back to her and as I looked into her eyes she began to giggle and cry happy tears. 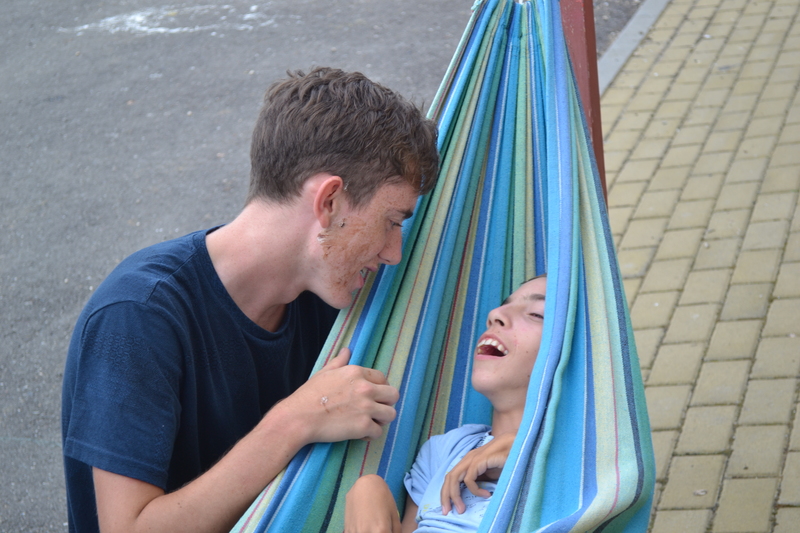 We continued to spend time together giggling, singing and jiggling, this moment taught me that you don’t need to know anything about someone or speak the same language as someone to love them. It became known to me that in Romania those living in places such as Ungereni, particularly in the past, are seen as the lowest of the low in society. But as followers of Jesus these are the people we are called to love, as Jesus first loved us. My prayer is that Cry in the Dark is able to continue to put compassion into action and that we can all show compassion wherever we are to whoever we may be with. If you want to know more information about Micro Gap please get in touch here.